In What Ways Are the Trim Levels Similar in the Audi A4 Allroad Quattro? The Audi A4 Allroad Quattro comes in three trims: Premium, Premium Plus, and Prestige. Just as with other car manufacturers, Audi produces the Allroad Quattro in the same size dimensions. Along with that manufacture wide trait, Audi also uses several other parts of the vehicle as common units throughout the trim levels. Every trim level of the Audi A4 Allroad Quattro uses the same engine—a 2.0-Liter, Inline four-cylinder motor that generates 252-horsepower and 273 pound-feet of torque through a wide range of rpms. The motor is paired with a seven-speed automatic transmission with double clutch capability that ensures smooth shifts at any speed. The specialized multi-link suspension runs throughout the trims, making driving off-road as comfortable as riding in Grand Rapids. 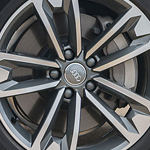 At Audi Grand Rapids we sell and maintain the Audi A4 Allroad Quattro with a level of expertise beyond the norm.